She is gorgeous! I have been admiring her on flickr, and I'm really looking forward to seeing more of your work. Lovely detailing! Love the dress and shoes, really sweet doll with a lot of personality. Oh, how many nice words about my work! Many many thanks to all of you! I am very glad, if my efforts were not in vain! In the near future I get into molding a new doll. I hope it will be interesting to you as well But I will not give up these current dolls too. That foot does make for more shoe options, I wonder if it fits a standard shoe size? So cool! It is a bit like the Twigling foot. I was going to make shoes for these dolls myself, so I can't say something about the standard size yet. I will need to try. Also, I thought to try such feet on porcelain, but this is only possible on a large doll. I guess at the small size, it's going to be ungracefully. Friends, finally I can show a girl of a new series Her dress is not finished yet, but nevertheless I decided to do a photo shoot. Her height is 34 cm. More photos you can see on my Flickr page. 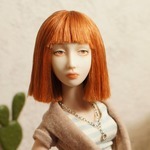 When her look is ready, I'll tell some details about the new series of dolls. Thank you for your attention! Lena, she is very lovely. I really like her double-jointed hips and her neck. Gives her wide range of movements. She is stunning! I first saw her face on Flickr- and now I can see the body is just as gorgeous!! And yes- please give some details- I can feel a saving up spree coming on!! and she sits so elegantly.